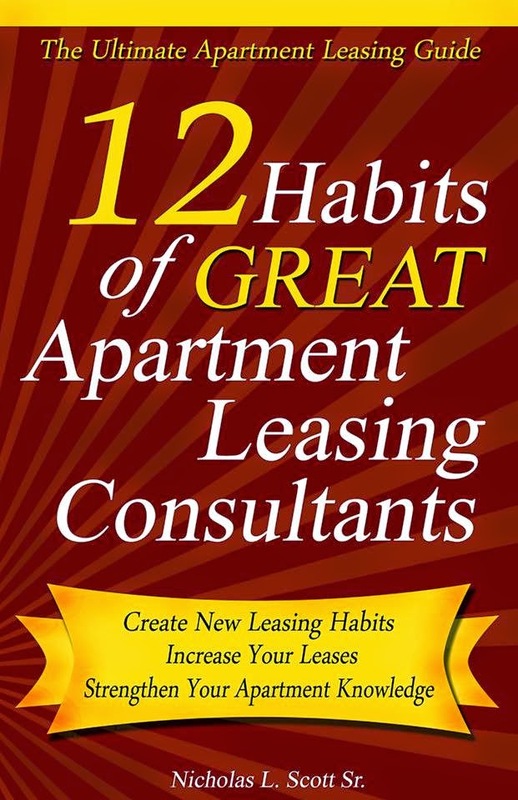 "12 Habits of Great Apartment Leasing Consultants"
About the book: 12 Habits of Great Apartment Leasing Consultants is the ultimate tool to help you boost your apartment leasing knowledge. This dynamic one-of-a-kind book will increase your closing ratio immediately once you have mastered the 12 Habits of Great Apartment Leasing Consultants. This book is not just for Leasing Professionals it is also perfect for Property Owners, Leasing Managers and Property Managers, from novice to expert, all will find this book an invaluable resource. In the straight to the point easy to digest text, Nicholas L. Scott Sr. offers his years of experience coupled with the knowledge he’s gained from other great leasing consultants, so you can take all of the guesswork out creating the habits you need to be successful!. If your objective is to gain more signed leases, train or refresh your Leasing Team or break into the industry, this book is for you! For you or your Leasing TEAM! The hottest Leasing / Sales Book this Decade! ALSO AVAILABLE ON AMAZON.COM (It just cost a little bit more Here's the link: 12 Habits Of Great Apartment Leasing Consultants on Amazon. 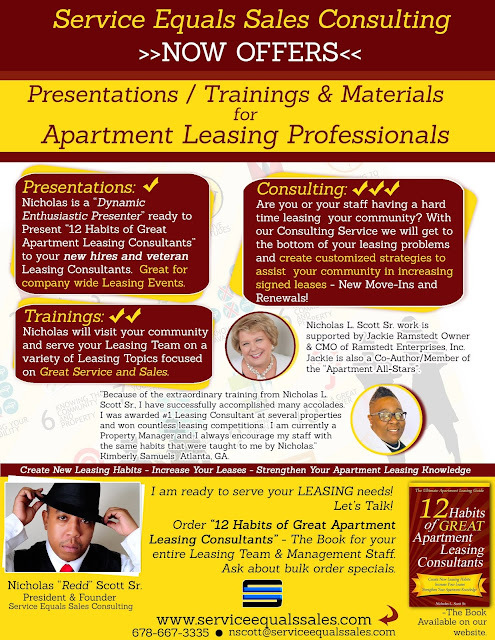 Book Nicholas L. Scott Sr.
for your next leasing training class! !